We are also running kitesurfing lessons at Castletown Beach on the Isle Of Man. We will be teaching on weekends. The lessons are available to book on weekends only and we need at least 3 customers to book for the course to go ahead. For more information please feel free to call. We have been teaching in North Wales for over 9 years and our staff are extremely dedicated to teaching professionally and going strictly by the IKO syllabus. 2016 will be our seventh season teaching on the Isle Of Man and we have the new North 2016 Kites and Boards ready for you to learn on. The idea of running a kitesurfing school on the Isle Of Man came after 3 clients flew over and took their lessons with us in North Wales, so we have decided that we should do the travelling and Isle Of Man should get Kitesurfing! The Isle of Man is fast gaining a reputation as a kitesurfing paradise with a lot of local dedicated riders enjoying this amazing place. Its wind record is awesome and you can kite in most wind directions because… it's an island! Chances are you'll have these amazing beaches to yourself and did we mention it's a really really wind island. 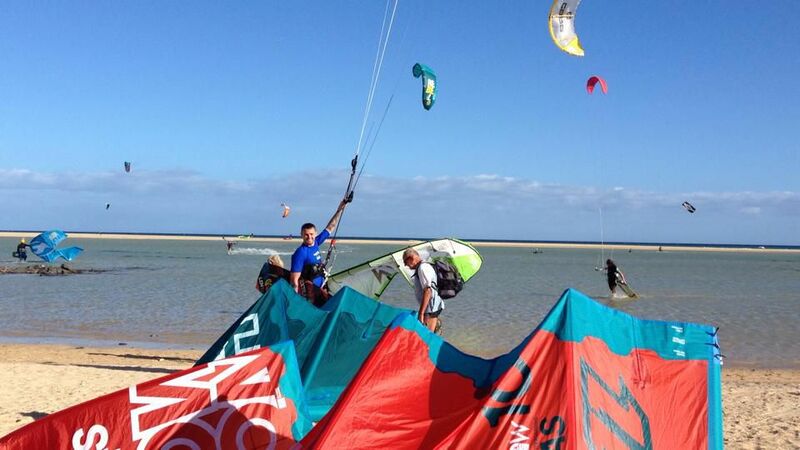 All it needs is a dedicated kitesurfing school, here we are 2016 is going to be a great year to learn to kitesurf! Book your lessons now! Below are the courses we offer on the Island. This is a great course to set you off on your kitesurfing adventures, realistically you should complete IKO Level 1 on your first day with us and you will be into the water learning your IKO Level 2 skills on our second day. Our aim is to get you into the water ASAP and over the years our teaching skills have increased and this has made teaching all our students easier. We have an amazing route to getting you onto the water. We like to cover the basics well which in turn will help you understand kite control effectively. All the equipment will be provided for your course except Neoprene Boots and Gloves. The lessons will run for 4hrs per day, and you will by taught by IKO qualified instructors. We have new ION 5.5 semi dry suits if you dont have your own wetsuits. Its important to us that you are comfortable on your course so that you can get maximum enjoyment out of your kitesurfing lessons with us. This 2 day course will teach you all you need to know to be a safe and proficient kitesurfer to the level you achieve in 2 days. If you would like more coaching after we can arrange an IKO Level 2 Intermediate course for you on our next visit. The Level 2 course goes over the work in the water. Body dragging, putting the Board on your feet, and the Board-starts. Please read through our booking Terms and Conditions before you book your kitesurfing lessons. We can also put together North Kiteboarding Packages for you after your lessons. We sell all the North Kiteboarding Range and you will get to try out the Kites and Boards on your lessons with us.